Published in the June 1983 issue of Personal Computer World magazine. Originally authored by A. Roe, assisted by K. Roberts and M. Stevinson - Balloon Addict. Published on the Best of PCW software for the BBC Micro compilation from Personal Computer World magazine. Later published on the Electron User Group PD Disc 47 in January 2000. 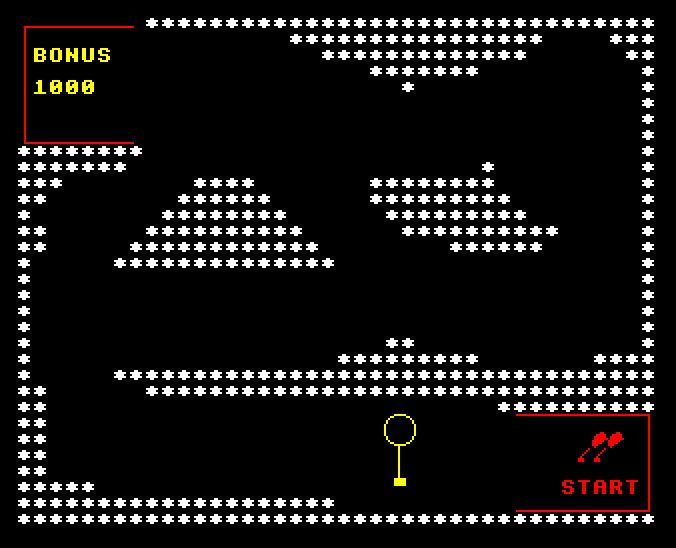 In this exciting game you must steer a balloon through a rocky ravine to safety. You control your balloon with the keys shown in the introduction sequence and you must avoid having the rocks burst your balloon. Easy, except that your balloon says from side to side in the wind and can easily swing back at just the wrong moment. It takes a lot of patience and skill to win at this game! Bon voyage, and I hope it doesn't take you eighty days to get through this one.